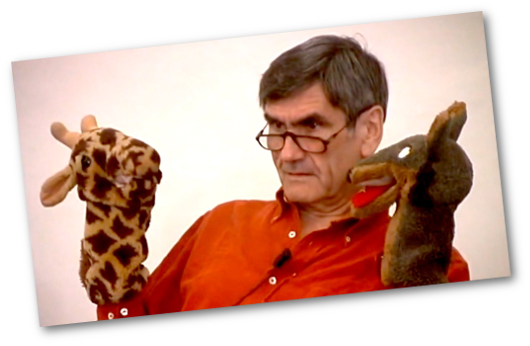 I’ve greatly benefitted from listening to Marshall Rosenberg talk about non-violent communication. Not because I adopted the whole system – it’s really not a good fit for me and my life, and it isn’t a good fit for the people around me. I believe that communication is two-or-more person process and Nonviolent Communication comes at the whole idea of communication as if you can, through your method, change the way other people communicate. It tries to centre as much of the impact on communication in yourself and how you interpret and react to things, with the idea that you have a lot of choice and control over how you’re hearing and processing things. There’s a tragedy to the worldview of Nonviolent Communication, a vision of the world as being mostly okay, and harm and violence only comes from how we’re taught to react after the fact. I’m not a believer in the fundamental media model of Nonviolent communication – Marshall Rosenberg was a believer in the idea that we’re taught to communicate violently, and part of that was to enjoy violence, which was why our media was overwhelmingly inclined to show violence. Media effects studies see this as a bit simplistic – the idea that we indoctrinate children by showing them violence, and without that they wouldn’t enjoy violence. Another element of NVC that deserves some criticism is that in its attempt to free people from judgment, it also seeks to decouple some actions from consequence and in so doing, punishment. Now, when you’re talking about whether or not you punish kids for talking sass at their parents, it’s very reasonable to see punitive strategies as fundamentally bad. But Rosenberg’s model decides to make this an absolute, and includes it in conversations about abusive parents, using Nonviolent Communication to seek resolution with their children who they abused, and the impact that’s had on their life. Now, perhaps there is room for healing there, and maybe even Nonviolent Communication can be part of it, but I think the world is a bit better a place when we remember the harm our bastards can do. It’s a bit panoptic of me, but I’ve seen enough abuse in social systems that extend a lot of trust to think that maybe absolute systems aren’t going to work. That said, I do recommend NVC, particularly to other AMAB people who are struggling with a lot of the emotional language and empathy that we were often told to keep hidden and closed off as children. It’s not going to fix you, but it can help shift your mind into both recognising others’ needs as reasonable, and showing your own emotional needs as reasonable things to express.